Poll year is giving state much needed political activity as from last few months’ state Govt is busy inaugurating many projects and also showing its concern for the common people. 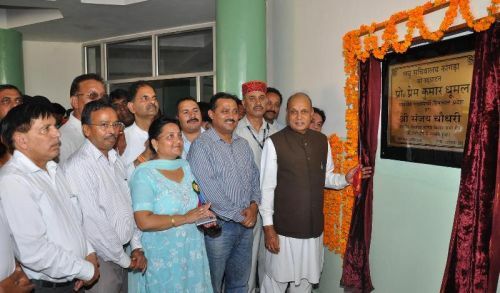 After covering every part of the state with its plaque bearing Chief Minister Prem Kumar Dhumal name today it reached Kangra city where he inaugurated newly constructed Mini Secretariat Building in district Kangra, completed at a cost of Rs. 5.60 crore. While addressing the public meeting at Kangra, CM claimed that Himachal Pradesh has ranked Number one in implementation of 20-Point Programme consecutively for the third time in the country. He gave credit to the hard working and honest people of the State who had lent there support and co-operation in implementation of provisions of 20- Point programme. Chief Minister said that State ranked at number two in increase in per capita income in the country which had increased from Rs. 43,900 to Rs. 53,600, thereby registering an increase of about Rs. 30,000 in three years. He said that sincere efforts had also been made to help people beat the heat of price rise by enhancing their purchasing power and subsidizing essential commodities and services to the people irrespective of their social and economic standing. He said that Social Security pension had also been increased from Rs. 200 to Rs. 450 benefiting about three lakh beneficiaries in the State and daily wages increased from Rs. 75 to Rs. 150. He said that there was no family which had remained ignored due to the progressive policies and programmes of the State Government. He expressed concern over the discriminatory attitude of Centre towards genuine developmental needs of the State. He said that immense damage was caused due to heavy rains to infrastructure and crops in every rainy season and the Government of India had not been fulfilling its responsibility of compensating the State for such damages and the State Government had been managing the same out of its own resources. He appealed to the people to stand by the State Government to obtain justice from the Centre and get its legitimate rights restored. Prof. Dhumal said that people of the state had now realized that who their well wishers were. He said that the Government had opened DSP office at Dharamshala with a view to maintain law and order in the holy town of Kangra and adjoining areas. He said that the State Government had not only fulfilled all the promises made with the people of the State but had done more than the promises made in the election manifesto. He said that Himachal Pradesh was first State in the country which had released Rs. 58 crore, provided free land and buildings etc. to make NIFT functional at Chheb, near Kangra. He said that now students from all over the country were seeking admission in the Institute which was also contributing towards tourism promotion activities in the area. He said that ESI Medical College and Hospital and IIT had also been set up which too were National level institutes set up in the State during current regime. Chief Minister said that the State Government had endeavoured to provide mini secretariat to each sub-division so that all administrative facilities were available to the people of the area under one roof. He said that so far nine mini secretariat buildings had been constructed and dedicated to the people of the state during current regime. He said that funds had been provided for completion of the secretariat building and Rs.1.50 crore would additionally be provided for additional facilities. He said that Rs.12 crore Mini Secretariat building was also nearing completion at Dharamshala. Sanjay Chanduary, local MLA, welcomed the Chief Minister and thanked him for dedicating mini secretariat building to the people which would ensure entire administrative services to the people under one roof. He said that RS. 12 crore augumented water supply scheme had recently been dedicated to the residents of Kangra town; opening sewerage sub-division to complete sewerage project for the residents of the town. He said that Rs. 36 crore Rani Tal- Kangra National Highway Improvement Project was under construction. He said that Kangra had the privilege to have NIFT in town which happened to be a National level institute. He counted various other developmental schemes which had been executed during present regime of BJP. Sarveen Chaudhary, Social Justice and Empowerment Minister, Vidya Sagar Chaudhary, former Minister, Ram Chand Bhatia, former MLA, Ghanshyam Sharma, Vice Chairman, Employees and Pensioners Welfare Baord, Sanjay Sharma, Member, State Media Advisory Committee, Gujjar Mal, President, Kangra BJP Mandal, K.R.Bharti, Deputy Commissioner, Daljeet Thakur, Superintendent of Police, other senior officers and prominent people of the area were present on the occasion.